Replacment Cartridges - 5 micron | U.S. Plastic Corp.
Filter removes dirt, rust, sand and algae. Effective on well or city water. 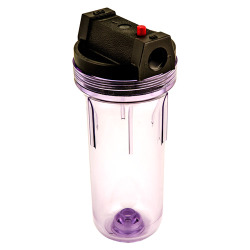 It uses a diamond-wound honeycomb cartridge that is completely sanitary and will not impart taste or odor. Polypropylene cap, with styrene acrylic nitrile housing. Measures 13" in length x 3-7/8" diam. 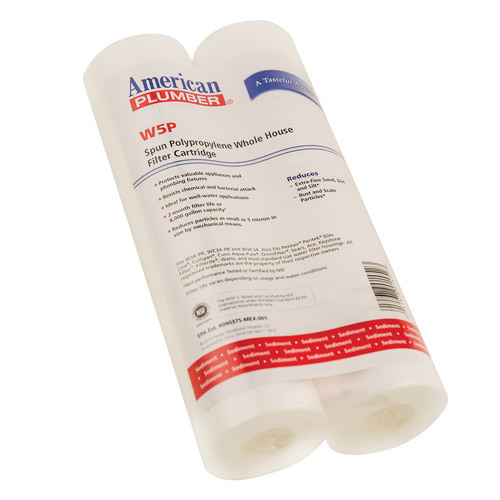 Easily installed on any water supply line for industrial, institutional use. 3/4" NPT. Rated @ 6 gpm. at 60 psi. Meets FDA. Max. temp. 125°F. PSI 125. Cartridge size: 2-3/8" x 9-3/4". 5 micron.